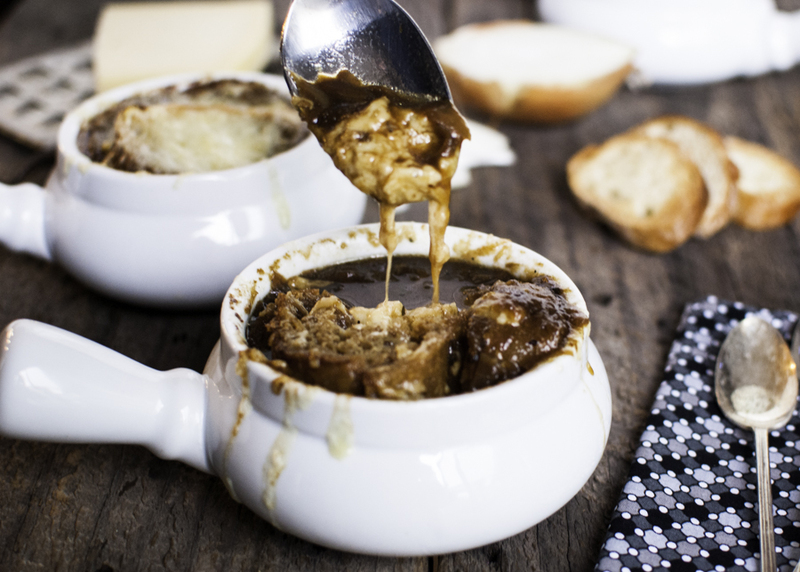 Winter is here….and that means warm comforting food, lots of soups, and cozy evenings. 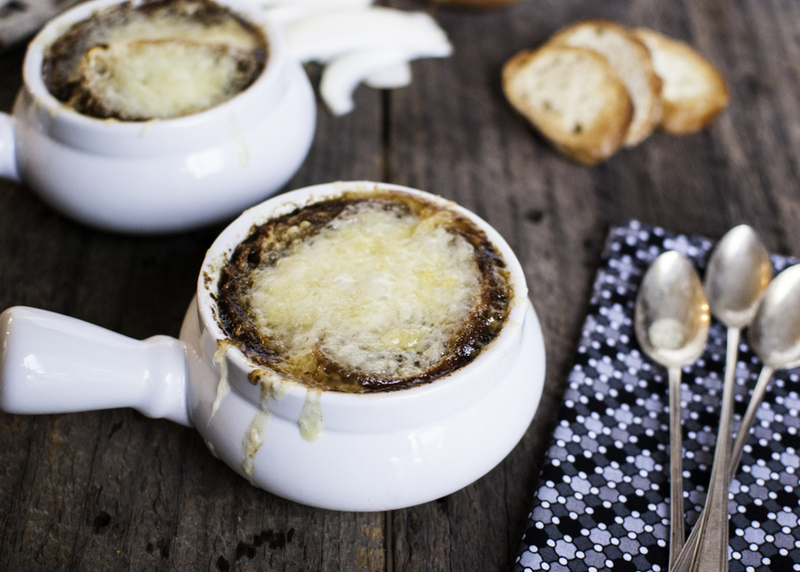 I’ve always had a thing for French Onion Soup, even as a kid! I think I was the only kid that actually liked the taste of onions. 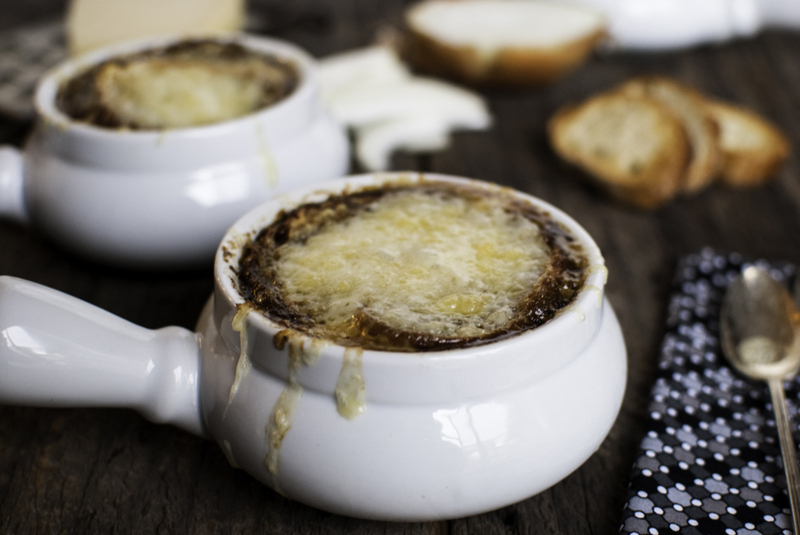 Let’s talk about what makes a really good onion soup…it’s a long process, and when I say long, I mean a whole weekend! So plan accordingly….I promise, it’s soooo worth it! If you want to do it right, you need to first make your own beef stock. We picked up beef bones at our local butcher. You will want to use bones from a source you trust. With the few ingredients in this soup, it’s important to use the best ingredients you can find. The stock alone takes 5 hours to make, most of it is done on the stove in a large stockpot, the actual roasting of the bones is only 45 minutes. Your house will smell amazing! The onions- oh the onions, the star of the soup, the reason you are making this soup in the first place! Don’t get fancy with the onions or try to mix it up. We tried walla walla sweet onions one year and the soup turned out way to sweet! A total let down after all the waiting and cooking and waiting and cooking. Use plain old yellow onions. These have the best flavor. Make sure to slice them the same thickness, so when roasting the onions, they all cook evenly. The onions need to cook down for 4 hours! The good news- you can cook them ahead of time and they will last up to 2 days in the fridge. The onions will cook down to a beautiful caramel brown, and smell amazing! Use a large dutch oven/pot, at first it will look like there are too many onions for your pot, but they reduce down a lot. To make beef stock, preheat oven to 475 degrees. Add 1 Tbsp of oil to a roasting pan and place beef bones in pan. Roast bones for 45 minutes until deep brown. Cut 1 onion in half, heat a small heavy skillet over medium heat. Place the onion, cut side down on the side of the pan, not over direct heat. Let brown for 30 minutes, this will add color to the stock. Remove the bones from the oven. Place bones and any bits on the pan in a large stock pot with about 5 quarts of water, just enough to cover the bones. Add the charred onion and salt. Meanwhile, cut the remaining half of onion and place onion, carrots, and leeks in a roasting pan. Toss with a Tbsp of canola oil, and place in the oven and roast for 20 minutes. Stir vegetables, than roast for another 20 minutes. After the stock has simmered for 5 hours, add the roasted vegetables to the stock with the herbs, peppercorn and garlic. Simmer for 1 hour. Turn off heat and allow stock to rest for 10 minutes. Strain stock thru a fine mesh colander. Toss the bones and vegetables. Store stock up to 3 days in the refrigerator. Cut off the tops and bottoms of the onions. Slice the onions thinly and evenly. You should have about 7 quarts of onions. Melt the butter in a large stockpot over medium heat. Add the onions and 1 Tbsp of salt, reduce heat to low. Cook stirring every 15 minutes for the next hour. Make sure to scrape the bottom of the pot. Continue cooking for 4 more hours, stirring every 15 minutes. The onions should be dark and caramelized. Stir in flour and cook over medium high heat for 2-3 minutes. Add the beef stock and sachet and bring to a simmer. Simmer for about 1 hour until liquid has reduced ro 2 1/2 quarts. Season with salt, pepper and a few drops of vinegar. Spoon soup into vessels leaving a few inches on the top. Toast baguette sliced under the broiler. 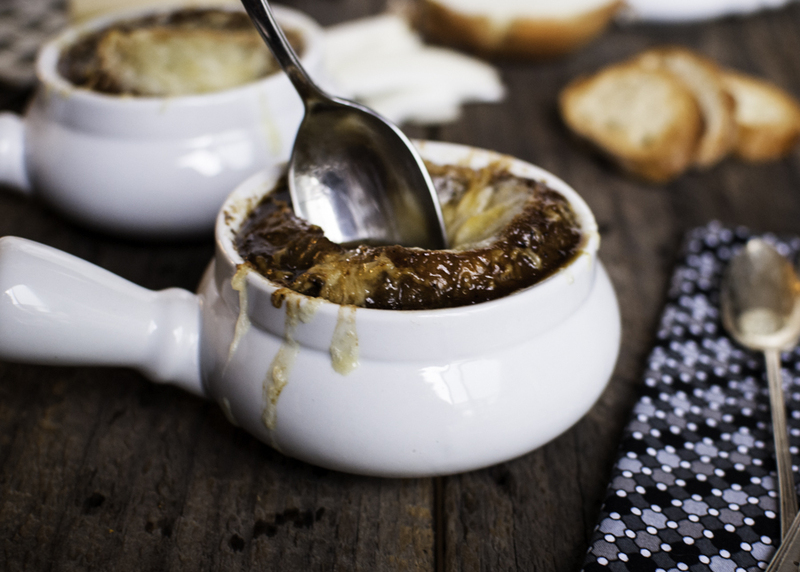 Place toasted slices on top of soup, then sop with cheese and place under the broiler until cheese is melted.